129 Carlingview Dr., Ontario, Canada. Rapid data was an innovative calculator manufacturer and marketing company of the early to mid- 1970s. It was reported in 1974 that a receiver had been appointed after the company had run into financial and technical problems (related to lack of control over the component technology) and it was in the process of re-financing. Introduced at the beginning of 1972, this model uses an innovative one-piece polypropylene casing. It also has an 8-digit LED display with the decimal point fixed to give two places of decimals (which is OK for money calculations). This was one of the first hand-held electronic calculators to sell for less than under $100 / £40 Sterling. 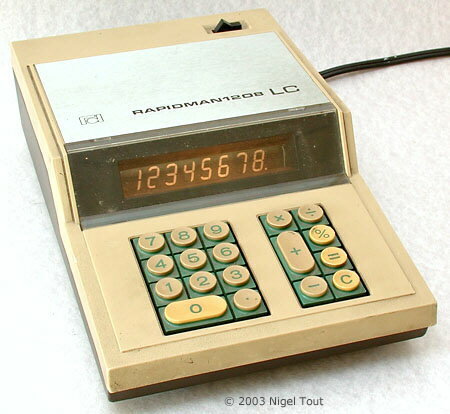 Introduced in 1972 this was one of the first LCD calculators, and has reflective digits lit be a filament lamp. Similar models were sold under the Sears and Lloyd's names, and appear to have been manufactured by Rockwell. For further photographs of Rapid Data hand-held calculators see the Calculator Photo Library on this site. Milton, R., Beaumont, A.J. (1974), Electronic Calculator Markets and Suppliers, 2nd. ed., Finresearch Series, London: Ovum, 15.